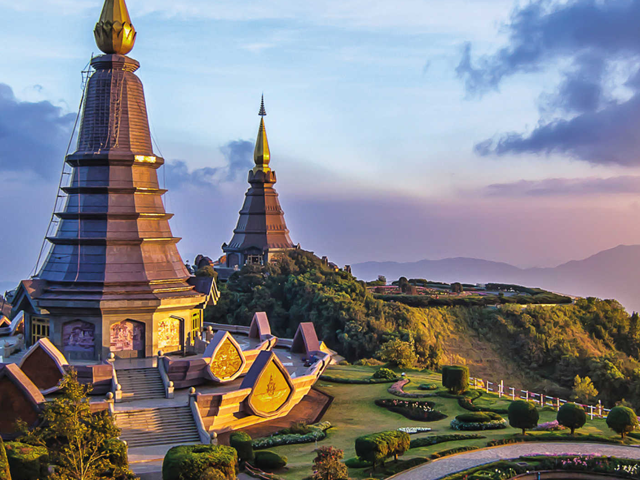 ➤ Upon arrival, you will be welcomed by our representatives and visit Wat Ban Den (Blue Temple - Chiangmai Mae Rim), one of Chiangmai’s most remarkable temples. It is also one of the largest temple complexes in Chiangmai province. The complex contains a large number of structures including an ordination hall, a viharn, a meditation hall, the kuti or monks living quarters, a drum hall and several other buildings. ➤ Thereafter, visit Orchid & Butterfly Farm on display are a profusion of blooms of all varieties, shapes, colours and prices from a few baht for the common strains to a few hundred thousand for the rare and exotic species. ➤ Continue to enjoy Monkey Show where the monkeys demonstrate and impressive range of talents. And also Human and Snake Fighting Show. ➤ Next, visit Mix Hill Tribes Village (Long Neck Village) and 3D Art Museum, where you can create your own activities and be fully immersed in the interactive 3D artworks. ➤ You will be given free time for shopping at All One Nimman (Nimman Road). Transfer to hotel for check in. ➤ In the evening, you will head to Khantoke Dinner where you can taste the Northern Thai food and experience the Culture through the Lanna Style Performance which will keep you entertained throughout dinner. ➤ After breakfast, proceed for Elephant Camp in a Natural Park which are both amazing and amusing performance from The Elephants. There are also get the Elephant for you to ride at own expense. ➤ Then, visit San Kham Pang Village (Home Industries) which another well-known place in Chiangmai Thailand. The major traditional handicraft center in Northern of Thailand those you can see Gems Gallery ,Honey shop, Leather Factory, Umbrella and Healthy Food Products as Royal Jelly Bee or Honey etc. ➤ Next, proceed to The Hidden Village in Chiangmai. Provide you a special experience from such an unique ambience and wide range of activities such as the jungle of giant insects & the house of animals and Dinosaur Town. Tonight, enjoy a delicious Steak Dinner (choose 1 of steak menu: Beef, Pork, Chicken or Fish) at The Hidden Village. ➤ After breakfast, you will proceed for a Full Day Chiangrai Tour. Along the way, you will visit the Mae Kajan Hot Spring where you can experience a natural phenomenon. ➤ Thereafter, visit the newest attraction - Wat Rong Khun (White Temple) or also known as Taj Mahal of Thailand, for its beautiful painting and built-up. ➤ Next, you will visit the Golden Triangle. It is the intersection between Mekong River and Kong River which is the gate of the borders in Thailand, Burma and Laos. ➤ Lastly, visit Mae Sai where you can shop around for some Myanmar goodies. ➤ Lunch and Dinner will be served at the local restaurant. ➤ After breakfast, you are free to explore on your own. You will then be transferred to the airport for your return flight home.